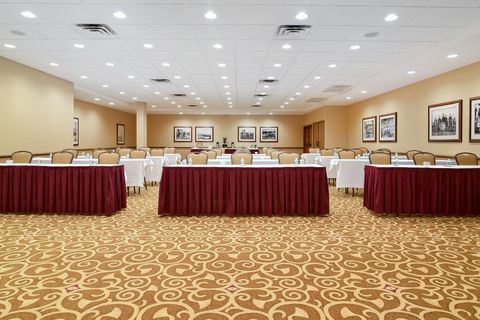 5,500 square feet of flexible meeting space is ideal for corporate, weddings, or social gatherings. We will take care of all of your catering needs for all of your events. Our ballroom can accommodate 200 guests for meals, and 160 for classroom set up; or it can be broken down into smaller event rooms. Our Gallery Room can accommodate 80 for meals, and 88 for classroom set up. We can also set up meeting spaces with crescent rounds, or theater style as well. All spaces are flexible to create the event that you are looking for! Give us a call today to discuss your event needs! Renaissance Ballroom is 3200 square fee of flexible meeting space and can accommodate groups as follows: Cocktail Style - 300 ppl, Rounds - 200 ppl, Crescent Rounds - 150, Classroom - 150ppl, Theater - 300. Room has a/v ports and we can order any equipment that you may need, complimentary wi-fi in each meeting room. Attendees can enjoy free parking for all events. Business or corporate travelers will appreciate our business support services, like faxing, photocopying and audio visual equipment rentals, as well as flexible meeting spaces that can accommodate small and medium-sized groups up to 300 guests. Pete and Larry's is a favorite place to relax.